Hands up who's had their fill of politics at the moment? 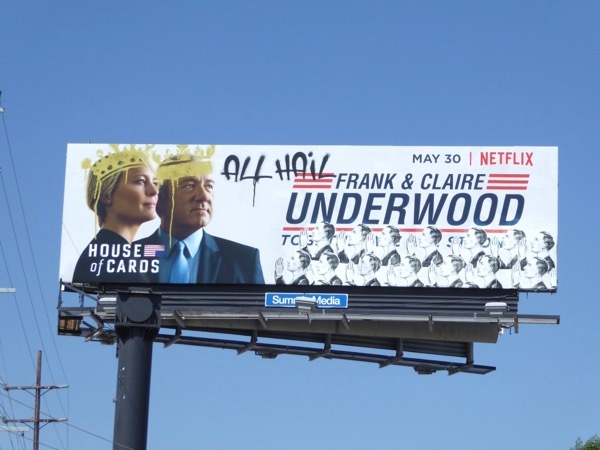 In this Trump era that we live in where anything goes, where you can say and do anything you like and seemingly get away with it, are the scheming shenanigans of 'Frank and Claire Underwood' still relevant? 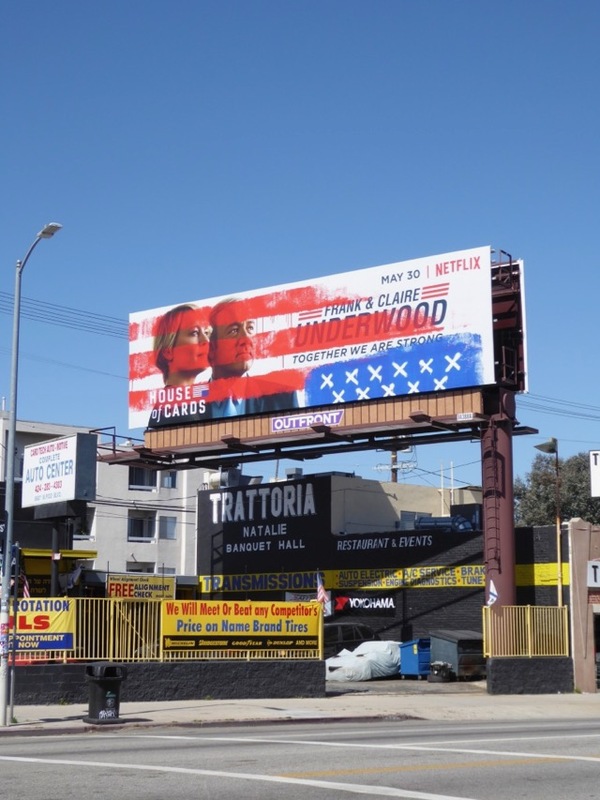 Netflix's House of Cards hopes so as the critically-acclaimed series returns for a fifth season of political maneuvering, alliances, betrayals, murder and cover-ups. 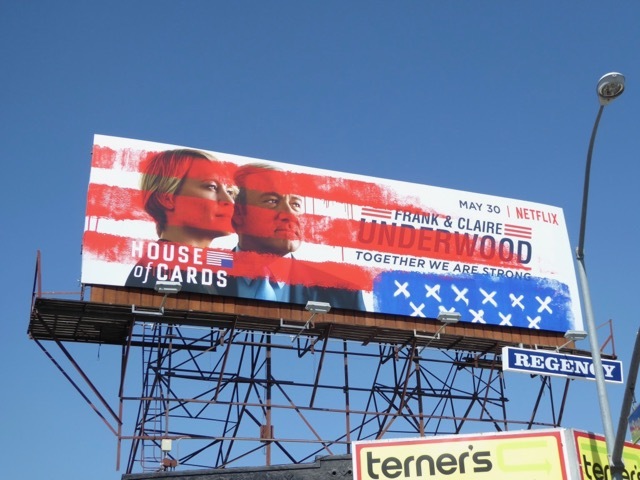 We've seen Robin Wright and Kevin Spacey's conniving married couple do terrible things to claw their way to the White House, and despite bitter disagreements over the seasons, they've always been stronger together. These faux patriotic Stars and Stripes season five billboards for the Netflix show were photographed along the Sunset Strip on May 18, 2017 and along Pico Boulevard the next day. Meanwhile the equally clever 'All hail' graffitied crown version was spotted along Venice Boulevard on May 28, 2017. 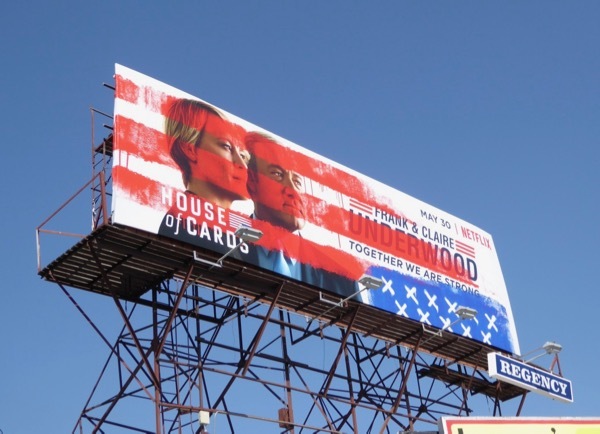 Fans of the gripping series can also enjoy these previous season promo billboards for House of Cards from 2013 to date. As we've seen in real life of late, will freedom of the press be the downfall of this President and First Lady, or will they scheme long and prosper together. 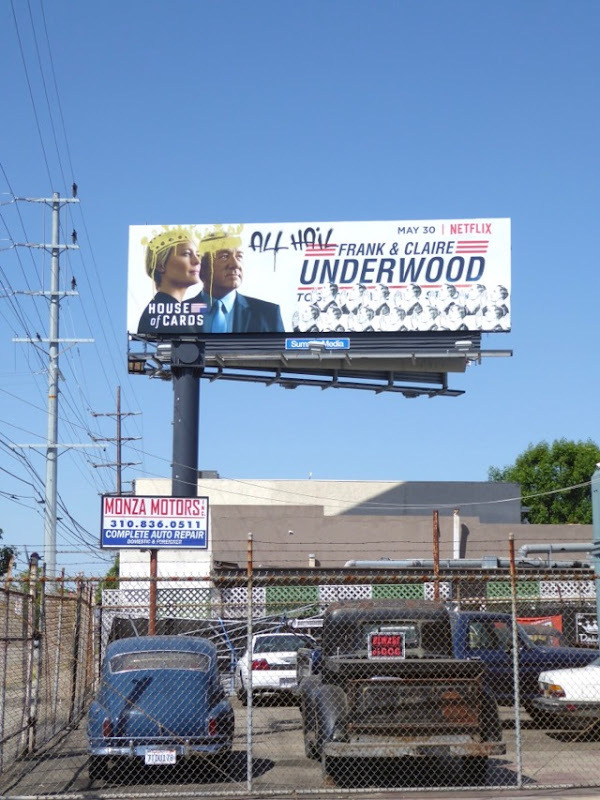 UPDATED: Here's also a cool Emmy consideration billboard for the fifth season snapped at the Sunset Strip ad site on June 2, 2017. 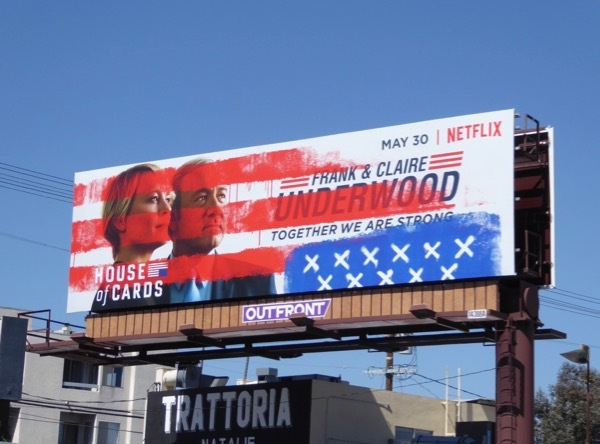 UPDATED: Even in its fifth season House of Cards still seems to be a television industry favourite, garnering six Emmy nods this year. 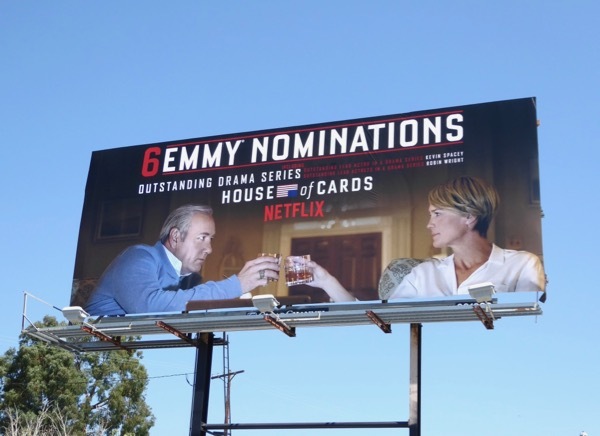 This Emmy nominations billboard with Kevin Spacey and Robin Wright raising a toast to their respective lead acting nods was snapped along Robertson Boulevard on August 8, 2017. 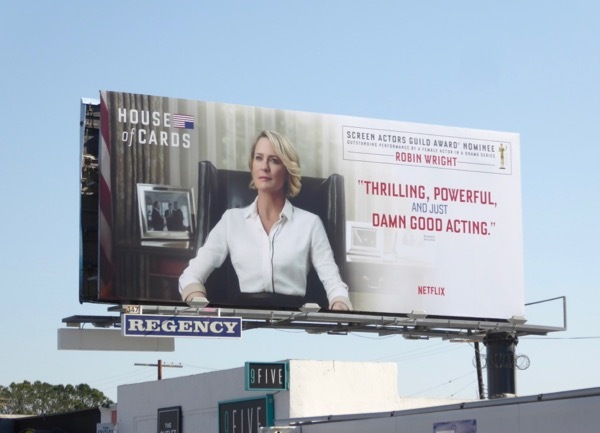 UPDATED: Congratulations to Robin Wright for her SAG Award nomination for the fifth season. 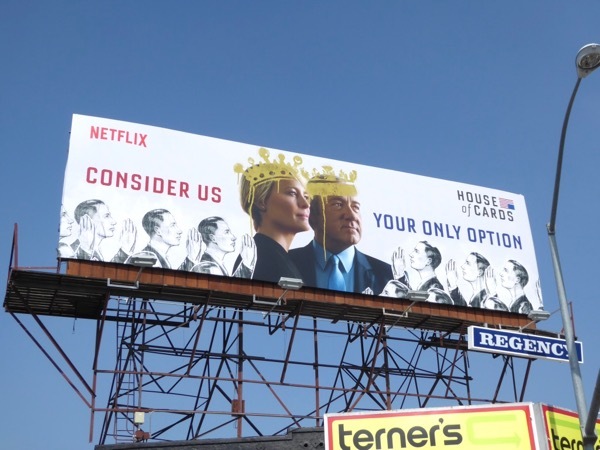 This consideration billboard was spotted along Melrose Avenue on January 11, 2018. 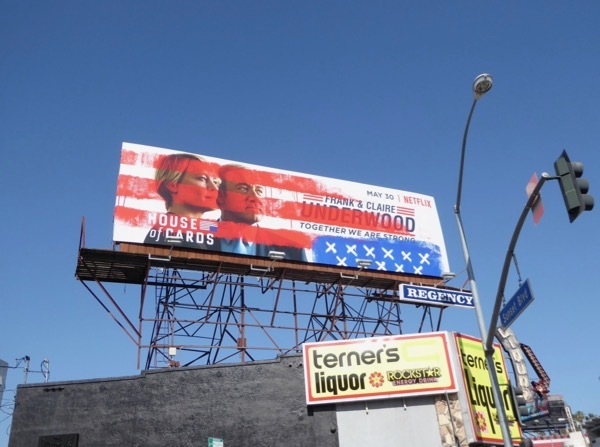 Let's hope Kevin Spacey's scandalous sexual harassment and assault actions don't jeopardise her chances of winning.